Courtney Sweetman-Kirk admits she’s on a golden run of form after the striker’s hat-trick at Oxford United helped send Doncaster Rovers Belles, who ran out 5-2 winners, top of FA WSL 2. Sweetman-Kirk edged the Belles ahead before half-time after Katharine Nutman had cancelled out Bethany England’s opener – and the floodgates opened in the last quarter-hour. Sweetman-Kirk struck twice in quick succession to take her season’s tally to 12 and, despite Nicola Hobbs’ own goal, Sophie Stamp rounded off a near-perfect afternoon for the Belles. 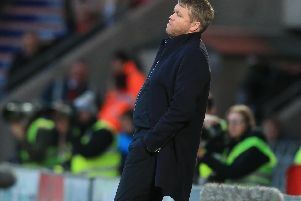 It means the Belles go three points clear of Reading – who now have a game in hand – and Sweetman-Kirk said: “I had a chance just before I got the third goal that I missed which I was a bit disappointed with as I thought my chance was gone, but you’ve got to keep going as things don’t always go your way. “I’m not really bothered how I score, I didn’t mind if they just hit me in the head, but it’s always a nice feeling when the ball hits the back of the net and I’m high in confidence at the minute. England opened the scoring for the Belles on 12 minutes after receiving the ball from Sweetman-Kirk, who had beaten Oxford goalkeeper Demi Lambourne to the ball. But Oxford fought back and Nutman equalised midway through the first-half – tapping in the rebound to Kayleigh Hines’ half-volley. The Belles regained the lead five minutes before half-time, Sweetman-Kirk latching on to Sophie Barker’s long ball and beating Lambourne with a wonderful lob. They then went on to finish a tightly-contested second-half with a flourish, Sweetman-Kirk firing in her second on 75 minutes after good play from Sue Smith. She completed her hat-trick moments later after rounding Lambourne, before Hobbs deflected the ball into her own net following Katie Stanley’s corner. But Stamp made it five for the Belles, chipping in from just outside the penalty area after Kasia Lipka’s initial shot was saved. And Oxford skipper Sahara Osborne-Ricketts said: “It was a difficult afternoon for us. I think the result was a bit harsh on us, but that’s football. We’ll regroup, and we’ve got a game on Thursday to try and put things right. “They finished well and took their chances. There was a bit of sloppy defending by us, but that’s something we can work on. “If you look at us last season compared to now, our confidence has come on. We’ve got a good team spirit so we’ll put this result behind us and move on.